Welcome to the world of wood block printing ~ all our textiles are printed using this incredible craft. Here you will see the key steps involved in printing our popular Casablanca Blues tablecloth. At Saffron Marigold, we source our colorful, exquisitely patterned block printed textiles from the desert state of Rajasthan. Woodblock printing, one of India’s foremost crafts, deeply rooted in India’s ancient past, enjoys a strong visual identity worldwide. Indian block printed fabrics effortlessly span the spectrum of traditional pattern and dress, to modern urban style. 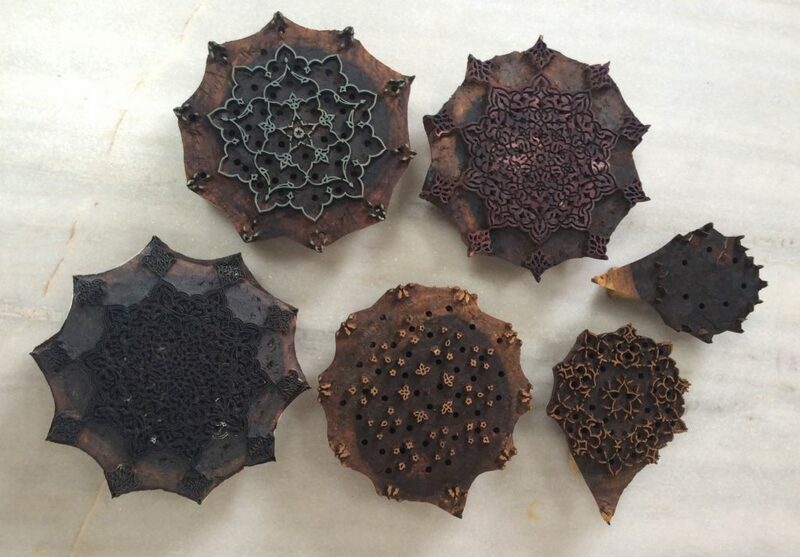 The tradition of woodblock printing has continued to exist in a parallel universe, stubbornly resistant to industrialization, and, to this day artisans practice block printing without the aid of mechanization or computerization. 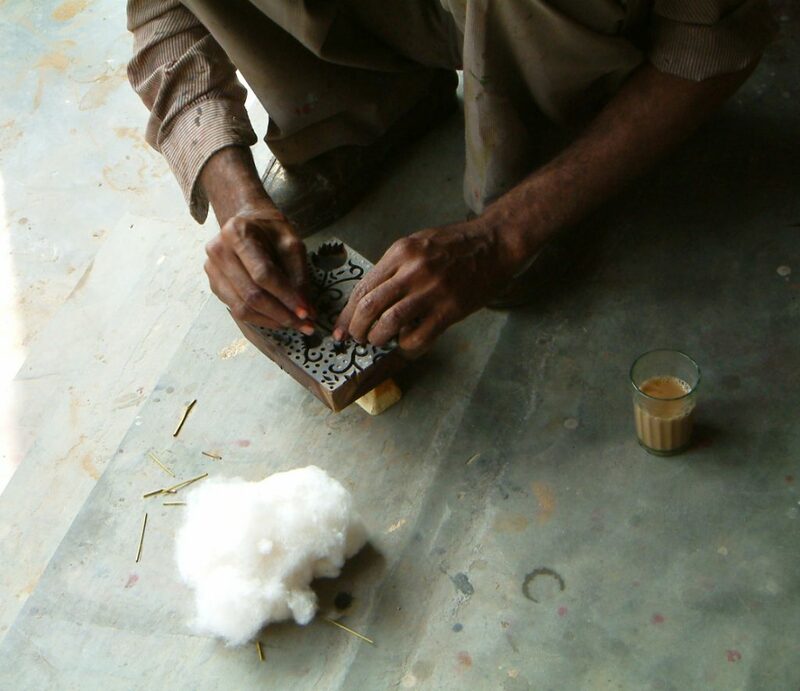 It is this defiant indifference to mechanization that gives block printed fabrics the aura of a pure craft form. Their distinctly handmade essence, and the casual, breezy, bohemian chic aesthetic they exude have made them an enduring favorite with designers and textile connoisseurs worldwide. We work with a family of artisans in Sanganer, a bustling township a few kilometers away from Jaipur, the capital city of Rajasthan. Sanganer, is a rural town caught in a curious time warp where the ancient and modern co-exist along with the spiritual and the material in amazing ways. While it is a society still entrenched in caste and class hierarchies, deeply religious and conservative – every street has a temple devoted to one of the several deities from the Hindu pantheon; young, modern India pulsates alongside, as youth in jeans flaunting the latest Bollywood hairstyles, zip past on their motorcycles feverishly communicating into their mobile phones. Even today, in Sanganer and even more so in outlying rural villages, people and animals are inextricably dependent upon each other and it is not uncommon to see camel drawn carts sashay their way down chaotic dusty streets, laden with shesham logs and bales of fabric, enabling with every step the metamorphosis of their cargo into gorgeously hued block print fabrics. In startling contrast to the exquisite textiles it produces, Sanganer itself is a grey-brown town that is indistinct and featureless: packed with unfinished two and three story concrete buildings, streets littered with garbage upon which the local population of pigs and cows feast, and a motley assortment of transportation that crowds its narrow streets. However, as you step away from the chaos of the main arterial roads, tucked away in the dusty bylanes there exists a vibrant ecosystem of fabric dyers, block makers, block printers, washers, tailors, fabric and dye suppliers that work synergistically to create the exquisite wood block printed textiles Sanganer is famed for. Block printed textiles have embedded within their fibers a rich cultural history shaped by tradition, conquest, colonization, trade, technology and entrepreneurship. They are part of a vibrant visual and material culture that has imbibed a multitude of influences over several centuries to evolve into its current unique manifestation and identity. India honed and developed an unequalled mastery in the secrets of natural plant dyes and mordants (metallic salts that allow natural dyes to adhere to fabric). This expertise enabled Indian printers to create textiles with uniquely complex designs and an extensive palette of hues that were coveted the world over. 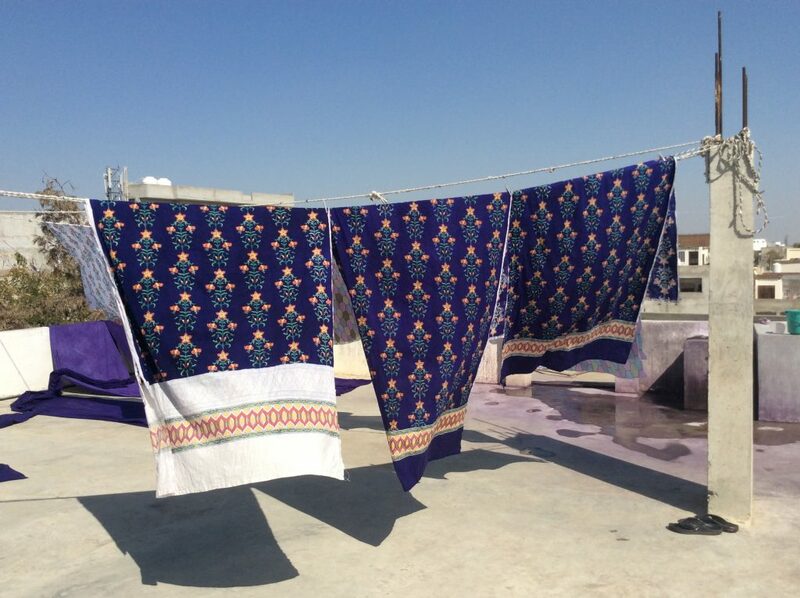 India’s hot tropical climate also allowed dyes to bloom to their deepest expression. Hence rich, intoxicating reds, blues and blacks were all prized creations of the dyers art. India also has one of the most expansive and magnificent pattern vocabularies owing to its long history of repeated invasions and consequent immigration, and the inherent diversity of its own indigenous population. Hand block printing enjoyed its most prolific period during the reign of the Mughal Empire (1526-1857) owing to the Mughals’ prodigious consumption of textiles where fabric and textiles were considered symbols of status. Since silver and gold coinage were in short supply exchanges of cloth were an accepted form of barter underpinning the economic structure of the Empire. The contribution of the Mughals to block printing’s pattern repertoire and aesthetic has been the most enduring. Floral designs suffused Mughal textiles of all types, as ‘metaphors for paradise’, alluding to the eternal garden of Islamic belief. The lasting popularity of these motifs is still evidenced in present day block printed textiles. England’s demand for Indian floral cottons led to an enormous boom that largely coincided with the golden age of the Mughal Empire. In fact the Indian textile industry was at one point charged with draining the British treasury. However, the decline of the Mughal Empire, the dawn of industrialization, the advent of synthetic dyes and a consequent well-planned strategy on the part of the British to sabotage the Indian handmade textile industry by saturating India’s markets with cheap mill printed cotton led to its sudden decline. The flow of inherited knowledge from one generation of artisans to the next, technical and artistic achievements related to working with natural dyes and mordants that had been refined over centuries of crafting textiles was all but lost and the supremacy of the Indian dyer was over. 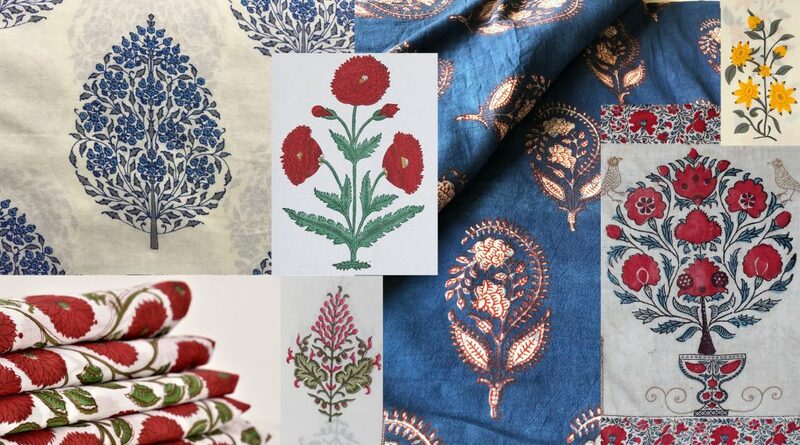 The emergence of the ‘flower power’ movement of the 1960s and 70s and the hippy, bohemian aesthetic it embraced along with a fascination for India’s spirituality resulted in a revival in the popularity of Indian block prints. In India, hand printed textiles have always been favored by the urban elite and there is a strong niche market for these textiles. 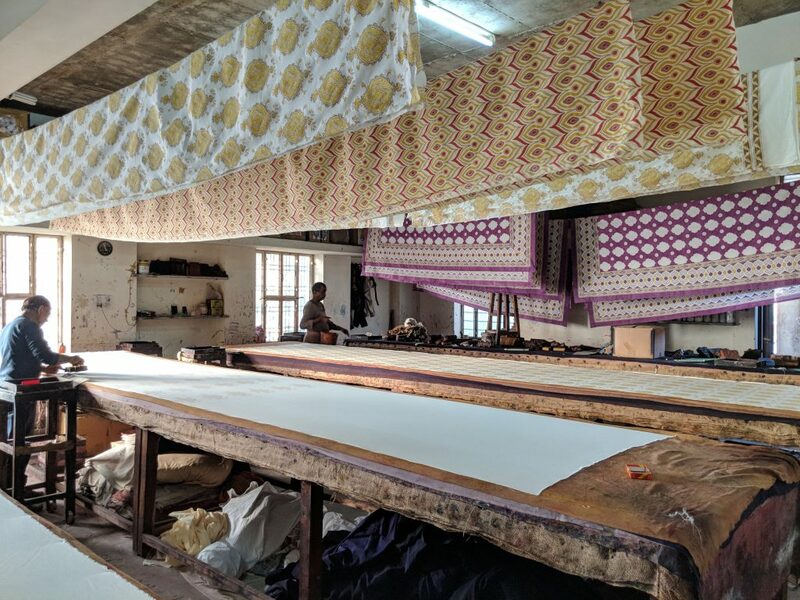 Today, the slow cloth movement, concerns about environmentally-friendly production and the resurgence of craft as an antithesis to the alienation felt by industrialization have all served to revive the block printing industry. 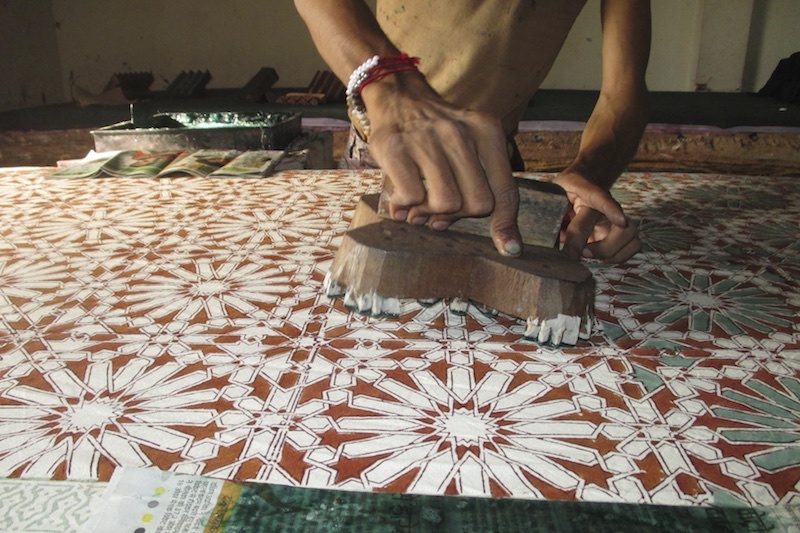 Block printing studios today, cater to the needs of niche markets and textile connoisseurs worldwide. 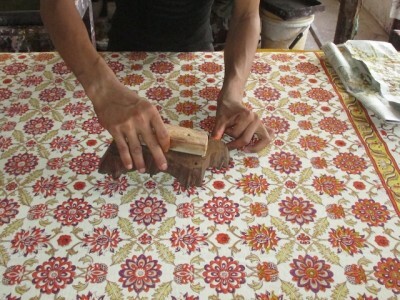 Despite its rich history, and the demands of today’s niche markets hand block printing is a dying craft that teeters on the edge of extinction because of India’s rapidly changing economic and social milieu. The influx of multinational companies and technological advances offer the youth easier opportunities to make a living thereby rendering immersion in labor intensive crafts tedious, unglamorous and old fashioned. At our Saffron Marigold studio we encourage young men to apprentice with us by paying above market rates to ensure the survival of this difficult craft for another generation. We believe this legacy keeps our world and our homes connected, beautiful, and soulful. 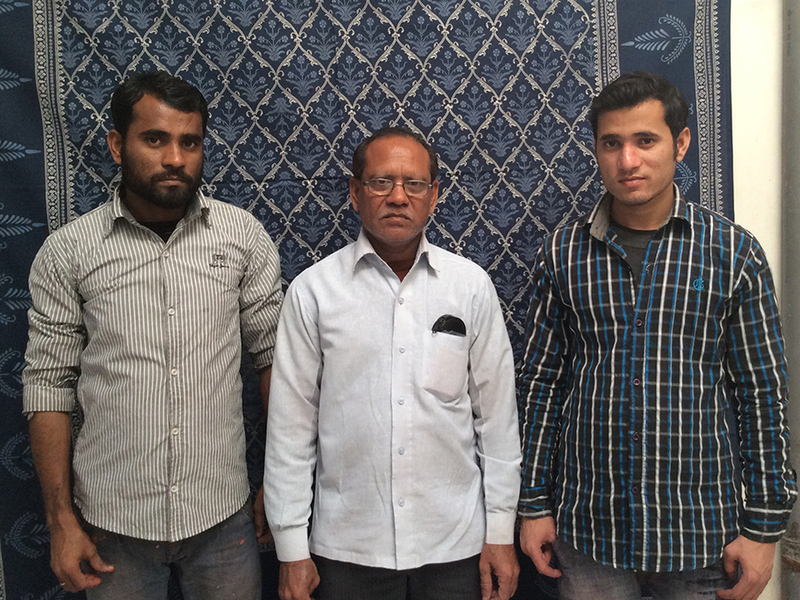 Meet Rafiq (center), our master artisan who has been with us since we started, now mentors his two sons Imran (left) and Irfaan (right). 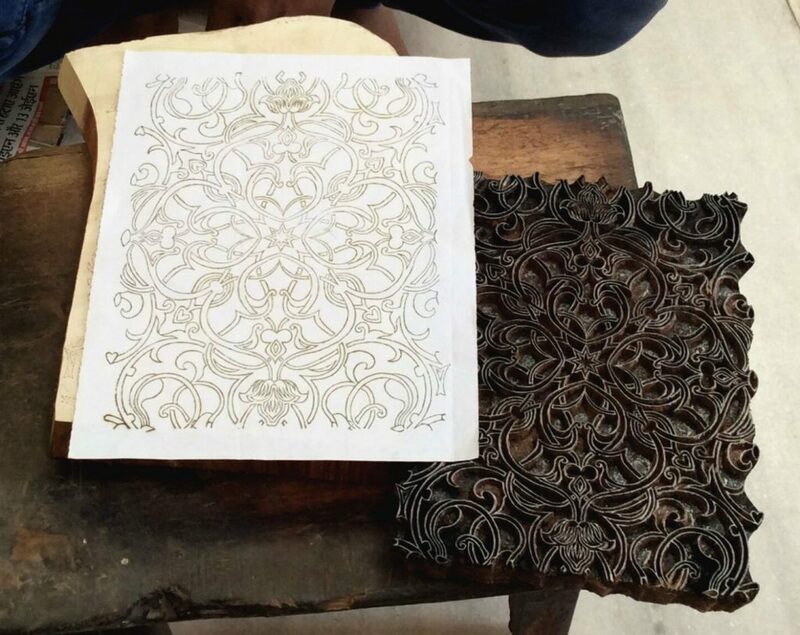 The cornerstone of the block printing process is the carved wood block. Carving blocks is tedious, and demands an exceptional degree of craftsmanship, which is practiced and taught over generations. Carving the outline block is the most challenging step in the process, and the outline block is often the most costly block in a design set. It is the skeleton around which the rest of the design is fleshed out. The most skilled artisan in a block making shop, often the owner, works on this piece. Work on the woodblock begins with an accurate freehand drawing of the design’s outline on paper. Using the outline drawing as a map, the artisan traces out the color fill blocks, one for each color in the design. A block starts out as a planed slice of shesham wood. Craftsmen trace the design onto the wood, and chisel it to a depth of one third of an inch. The precision that a master block maker achieves with his meager arsenal of hammer and chisel is truly extraordinary! The resulting woodblocks are works of art in themselves! Once the blocks are carved, the artisans leave them to stand in large trays of mustard oil for a couple of days. This is done to prevent warping, caused by moisture absorption from liquid dyes during printing. Later, they drain the excess oil from the blocks by leaving them to stand on wads of fabric for several days. Tiny holes are then drilled into areas intended for application of flat color. These tiny holes are stuffed with cotton at the time of printing to ensure even application of color. Generally the size of a woodblock is between five to eight square inches. However in instances where the design requires it, blocks of up to fourteen inches may be carved. The size constraint of the blocks defines the parameters of viable design, hence small motifs and repetition characterize Indian block print designs. The number of blocks required for a design can range from 3 to 30 depending on the complexity of the design. It is interesting to try to estimate the number of blocks used to print a block printed textile. It is possible to do this by studying the design in terms of two characteristics. First, the number of colors used – since each color will have its own block. And second, the unique components of the design (for example, the presence of an elaborate border in addition to the main design) must be counted in order to estimate the total number of blocks used in one piece of fabric. Artisans use separate sets of blocks to create the fabric borders (the outline blocks, plus color fill blocks), which are distinct from the block set used for the main design. 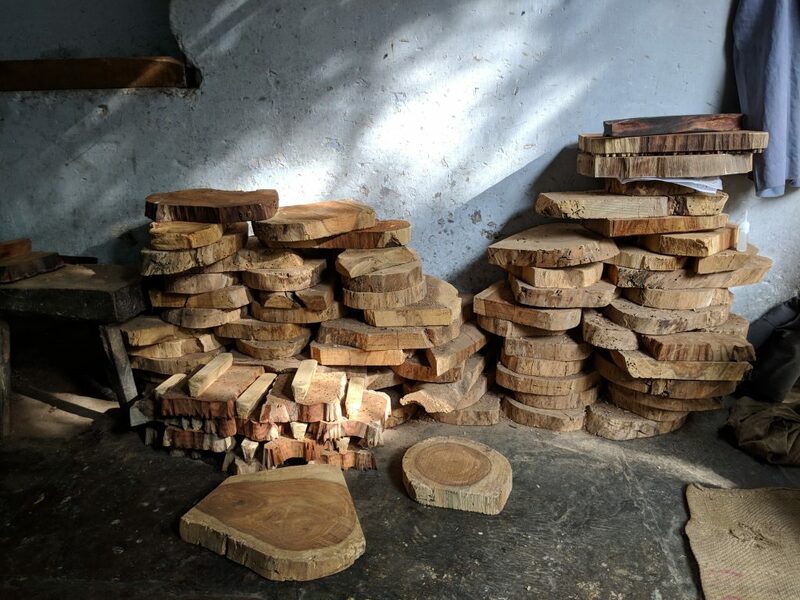 Depending on the complexity of the border, its size, and the sequence in which it is to be printed, the border itself may consist of several sets of wood blocks. Next, craftsmen bleach the cotton fabric by immersing it in a gentle bleaching solution. It is then passed through a dye vat, where it is rolled between two rollers, positioned on either side of the dye vat. The rollers help squeeze out excess dye to ensure its even application. 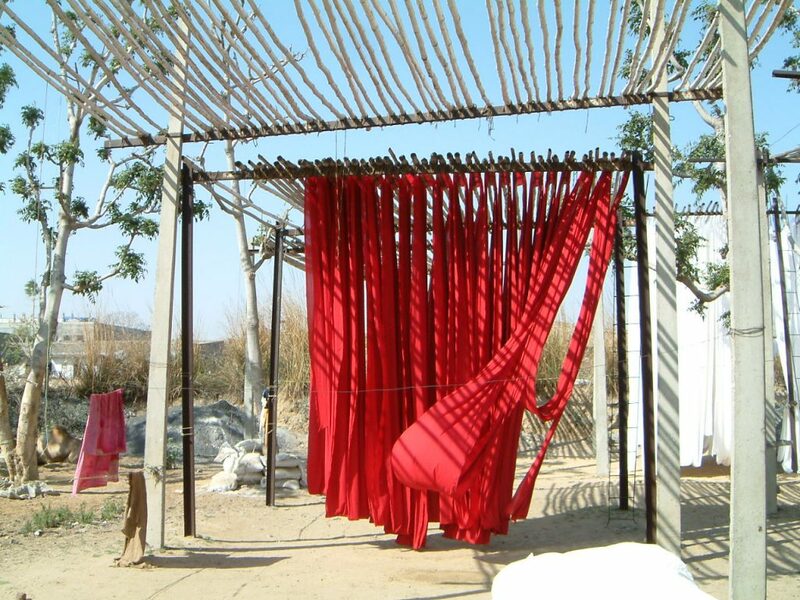 Then, the fabric is left to dry in the hot Rajasthan sun, on tall bamboo frames. After drying the fabric is taken to the finishing units where it is pressed on hot roller presses. 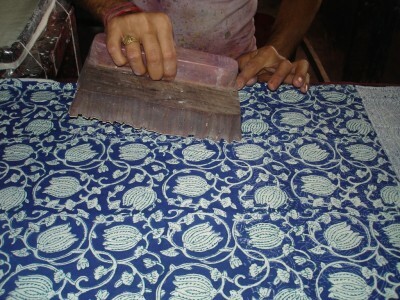 At long last, the block printing process commences with an evaluation of which dyeing technique is best suited to the design at hand. While easy-to-mix pigment dyes are favored, the luminous colors achieved by vegetable dyes, and the color fastness guaranteed by rapid, indigo sol and discharge dyes make them attractive options too. Aided solely by his intuition and experience, the color master mixes, with amazing accuracy, the various colors required by the design. By simply looking at the pantone shade desired he is able to formulate his color recipe with a magical 95% accuracy! After the dyes have been mixed and tested, a dye pad is prepared. The dye pad consists of a rectangular wooden tray into which a metal frame is fitted. The frame has several yards of nylon rope tautly wound around it. The taut rope mesh provides a spring effect during printing. The body of the pad consists of several layers of coarse sacking material piled on top of the rope mesh. The final layers however, are pieces of finer fabric: like silk, chiffon or voile. The choice of the final layer fabric depends on the dye saturation required for printing. Once the trays are prepared, an appropriate quantity of dye is poured into them. Workers even out the surface of the dye pad with a wedge of wood and place it on wheeled wooden carts, with each color on a different cart. They distribute the woodblocks color wise, amongst the carts, and organize them in the order of printing on the racks below. 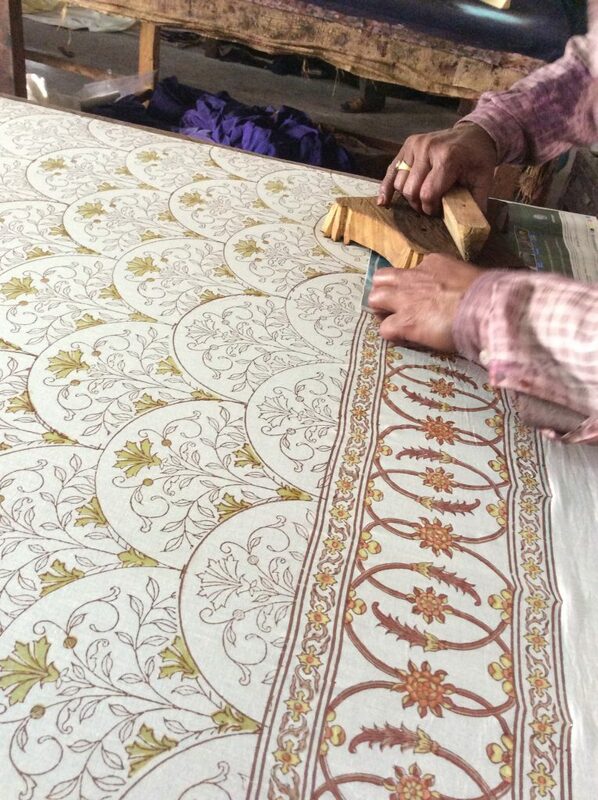 Craftsmen meticulously measure the fabric, then cut and pin it tautly onto well padded, 5 meter long tables. Products like curtains, bedspreads and tablecloths which have three (and often four) sides of borders render yardage printing impossible. Hence, each individual product is measured, cut and printed one at a time! Printing follows an outside in orientation, where the border is printed first followed by the main design. Before any of the color blocks are used, artisans print the outline of the design. The printer dips the outline block into the dye pad and moves down the length of the table, stamping the fabric by carefully placing the block on the fabric and striking it with the heel of his hand. The block carver chisels registration points on the outline block, which serve as visual markers that ensure the alignment and positioning of all the other blocks that follow. In fact, it is these registration marks on block printed textiles that help distinguish them from mass produced screen-printed textiles that are often sold under the guise of hand block prints. 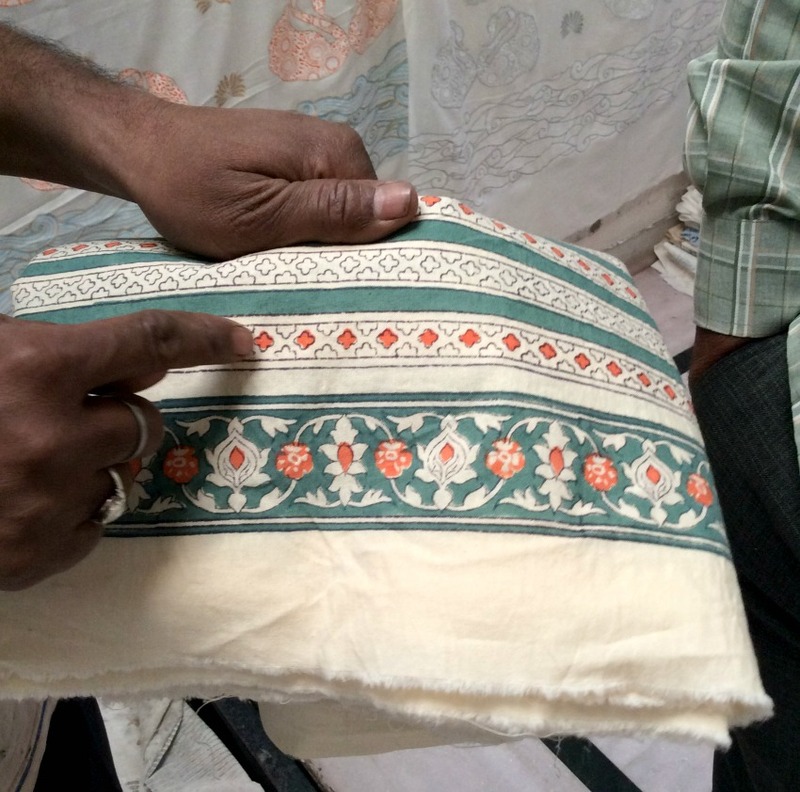 A close inspection of any authentic block printed textile will reveal these registration marks. Once again it is worth noting that no rulers or measuring devices are used during printing. The printer’s hands and fingers are his only measuring aids. The most experienced printer is assigned the task of printing the outline since it provides the framework on the basis of which the rest of the design is printed. Once he prints the outline, the remaining colors are filled in before the fabric is repositioned. Most printing houses have flat terraces atop their studios where finished pieces are left to sun for a couple of days so as to fix the pigments. Once the textiles are completely dry, they are sent to the local washing facility where the appropriate washing technique is employed based on the technique of printing. A lot of care and attention needs to be paid at this stage too, since negligence here by adding either too much or too little acid to the wash can ruin an otherwise impeccably printed piece. 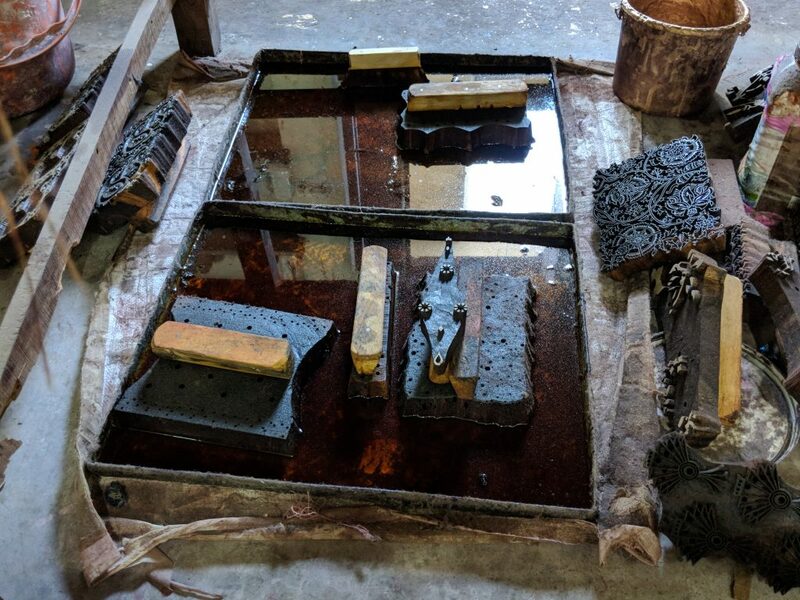 This is especially so in the case of indigo sol and rapid dyes where the true colors only emerge once the fabrics are immersed in an acid bath. Finally, the washed fabrics are brought back to the studio where they undergo the final finishing processes. They are ironed, stitched, meticulously checked for quality, and finally packed and labelled, ready to make their long journey around the world from Sanganer, Rajasthan to our warehouse in Petaluma, California! We hope you enjoyed reading this post. And that it helps us all gain an even better appreciation for these gorgeous textiles! Please do tell us what you think by commenting below because that helps us stay focused on doing work that you, our valued customers, care for most. We would be thrilled if you decide to buy our textiles. We have more than 40 collections with thousands of items. You can shop all our collections here. We would love to stay in touch! You can enter your email address all the way at the bottom of this page. A special surprise awaits! Wonderful and eye opening article, showcasing the amazing reverence to this beautiful craft. Thank you for sharing, enjoyed learning more about this. Thank you! We are hoping this will become a foundational resource for our customers who want a peek “behind the curtain”. So glad you enjoyed reading it! 2 Suggestions: 1) Add your company’s care and respect for these gifted artisans. I’m hoping they have excellent benefits and are well-paid for their fine work, but I didn’t see a mention about your concern for their welfare, so I’m a bit concerned. 2) If these special dyes are environmentally sound and sustainable, you don’t mention that either. I have bought several items from your company, but I’d like to be assured that your workers and the environment are front and center in the production considerations of your beautiful products. I’m thinking, “yes probably,” but it would be nice to be certain. And it would be a selling point for new customers. Really enjoyed seeing this. It allows us to fully appreciate what we are buying. Beautiful! So great to see how my table cloth and napkins were made. It’s great to support a traditional art the way you are doing. Such thoughtful grace and beauty. So talented. We agree–though admittedly we are a little biased! 😉 Thank you for reading and reaching out Kristin! Fascinating description of the process, and the place where all of this happens. Thank you so much for making this information available!